I TUOI EVENTI IN UN’ATMOSFERA SOSPESA TRA SOGNO E REALTÀ. 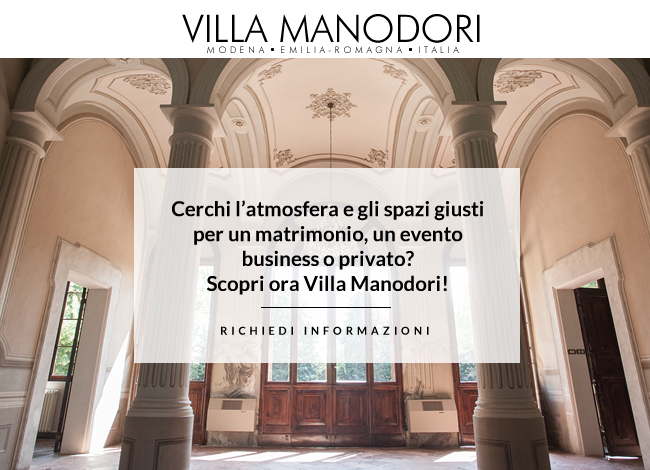 VILLA MANODORI: PURA TRADIZIONE EMILIANA. PERDITI TRA LE SUGGESTIONI DEL PARCO E DELLE LOGGE, TRA LE COLLINE ALLE PORTE DI MODENA E I SUOI CENTRI NEVRALGICI. LA LOCATION IDEALE PER EVENTI PRIVATI, CONGRESSI, GALA, SHOOTING. UN AMBIENTE RAFFINATO E PERSONALE NEL CUORE DELL’EMILIA. IL RISPETTO DEL PASSATO PER RESPIRARE ANCORA OGGI ANTICHE ATMOSFERE: UN RESTAURO METICOLOSO CHE NON HA ALTERATO GLI AMBIENTI, PER SPAZI ACCOGLIENTI E SCENOGRAFIE AFFASCINANTI.